Bounce ‘N’ More, LLC is a family owned and operated party rental business serving Garland. 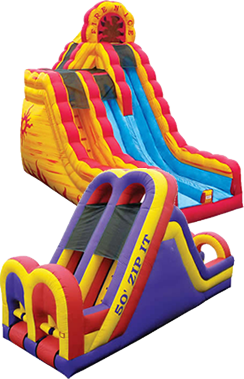 We will deliver all types of fun equipment to your event in Garland whether its a birthday party, corporate event, church function, fundraiser or special gathering. Our mission is to provide quality, safe party rental equipment in Garland, TX that is clean and sanitized, with the best customer service, on-time delivery, and affordable pricing. There are so many great places to have your event in Garland. Some of the parks we are familiar with are: Ablon Park, Audubon Park, Windsurf Bay Park, and Spring Creek Greenbelt. We are committed to the safe operations of our party rental equipment in Garland, Texas, as demonstrated by our successful completion of the Advanced Inflatable Safety Operations Certification. As a consumer using an inflatable bounce house or water slide for any event, you deserve the right to find qualified and dedicated operators who are safety conscious with a strong commitment to providing a safe enjoyable experience. Call us to schedule your next event in the Garland area.